Just like other joints, like the knee or the elbow, the hip can suffer injury from trauma, overuse, lack of conditioning or a simple mishap. Hip pain is your first sign that something has gone wrong, but the source of that pain can vary. The hip contains the body’s largest ball-and-socket joint, which means that this joint can bear an extraordinary amount of weight and pressure. When you move, a cushion of cartilage keeps the joint moving freely. In athletes, hip pain can occur following some kind of hard contact. A common injury among football players, for instance, is called a hip pointer – a blow to the pelvis that causes hip pain. When a hip pointer occurs, the bone just under the waistline can be bruised. In more severe cases, a fracture may occur. Long-distance runners, basketball players and ballet dancers – all of whom jump on hard surfaces – may suffer stress fractures of the hip. Women, who typically lose more bone mass to osteoporosis, are more prone to hip fractures than men. And for women age 65 and up, a hip fracture is a highly serious matter. According to a 2011 study by the Archives of Internal Medicine, women above age 65 who fracture a hip have double the mortality rate within a year’s time as women without hip fractures. The labrum, a ring of soft tissue around the rim of the hip joint, is responsible for keeping the femur (thighbone) in place. When overstressed, the labrum can become injured. The resulting labral tear is characterized by a “catching” sensation along with some pain. Hockey players, golfers and soccer players – athletes participating in activities that involve fast pivoting around the hip – can be prone to labral tears. The bones, tendons and cartilage of the hip can all be subject to such medical conditions as tendonitis, bursitis and arthritis. These conditions can lead to a breakdown of cartilage and an inflammation of the joint, causing hip pain and reduced range of motion. Age, physical conditioning, genetics and diet can all contribute to conditions that cause inflammation. When the hip’s ball-and-socket joint experience abnormal contact and damaging friction, this is a result of the condition known as Hip Impingement or femoroacetabular impingement (FAI). Often times the condition exists without being noticed, until discomfort persists in advanced stages. Athletes will often agitate the condition sooner than non-athletes due to enhanced joint movement within the context of sports. There are different types of hip impingement – cam impingement is that caused by deformity of the ball at the top of the femur (the thigh bone) and pincer impingement is the condition associated with a deformity of the socket. Combined impingement indicates that cam and pincer impingement are both present. Hip impingement should be medically addressed since the results of wearing can lead to the onset of osteoarthritis. Depending on the severity of hip impingement and other factors, non-surgical treatment options may include a modification of activities, physical therapy and anti-inflammatory medication. If surgery is required, minimally invasive arthroscopic hip surgery would most likely be the procedure of choice. Snapping Hip is a condition that presents itself in a snapping sensation, sometimes accompanied by a popping sound, in the hip during various movements, such as walking, running, moving the leg in a swinging motion or even getting up from a chair. The sensation can range from a mild annoyance to a physical hindrance that affects athletic performance. The snapping may occur in a variety of areas where muscles and tendons move over bones within the hip. The outside portion of the hip is the most common area of snapping hip. It is where the iliotibial band passes over the protruding part of the femur known as the greater trochanter. Excessive snapping hip can be especially problematic, as it can lead to hip bursitis – the thickening and inflammation of the bursa sac. Other areas of the hip that may lead to snapping hip syndrome include the front of the hip and the back of the hip. Additionally, damaged cartilage within the socket of the hip can become loose and cause the join to catch, thereby creating a snapping hip that can become painful and debilitating. Physical therapy is a common non-surgical treatment for snapping hip. In more severe cases that require surgery, minimally invasive arthroscopic hip surgery is often a viable solution. Treatment of snapping hip is entirely dependent on the particular circumstances of the individual case diagnosed. Arthritis of the hip is a condition that involves a loss of cartilage between the head of the femur (thighbone) and the socket area of the pelvis where the femur fits into the joint (the acetabulum). The absence of cartilage, which is sometimes the result of age-related wear and tear, causes the bones to rub against one another, leading to inflammation (swelling) in the area. The inflammation can become painful and affect range of motion within the joint. 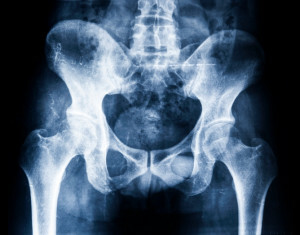 X-rays are often used to diagnose hip arthritis, as the loss of cartilage can be seen within the space between bones. Treatment for arthritis of the hip is dependent on a number of factors, including severity of the condition and age of the patient. Treatment options include changing activities to reduce stress, using a cane to shift weight away from the affected joint, pain relief and/or anti-inflammatory medication, prescribed exercises, weight loss and hip replacement surgery. Hip replacement surgery has become a popular and highly successful option for the millions of Americans suffering from arthritis, including age-related osteoarthritis − the condition of cartilage worn away that results in bones rubbing against one another. Another degenerative hip disease that may require hip replacement is avascular necrosis of the hip, a condition where a loss of blood supply to the head of the femur (thighbone) causes death of the bone tissue. Hip fractures and other hip conditions, including some that appear in childhood, can lead to the need for hip replacement surgery. Fortunately for patients, hip replacement surgery is often performed with minimally invasive surgery. The procedure involves two small incisions that allow the orthopaedic surgeons to access the socket and femur without the need to cut tendon and with minimal impact to soft tissue in the region. The ball and socket – the rounded head of the femur and receptacle area of the pelvis – are replaced with prosthetic devices. The minimally invasive procedure provides patients with significantly shorter time spent in hospital care and faster rehabilitation. There are cases that due to their complexity of nature require traditional surgery for hip replacement. However, while traditional surgery requires longer hospital care and recuperation, like minimally invasive hip replacement surgery, outcomes are typically highly successful − enabling patients to move more freely without the pain experienced in the hip prior to hip replacement surgery. For patients of all ages and conditions, hip pain can spell the difference between normal activity and a less active lifestyle. Board certified orthopaedic surgeon Howard Gelb, M.D. has successfully treated hundreds of patients with hip injuries over the past two decades. The physicians at the Gelb Sports Medicine & Orthopaedic Center work with patients to explore options that include physical therapy and minimally invasive procedures, such as arthroscopic surgery, to address hip injuries. Regardless of the treatment required, our patient-focused practice will determine a treatment program designed to mitigate the effects of hip pain and strengthen the joint to protect it from future damage. Those suffering from pain or discomfort as the result of an injury or condition of the hip will be best served to seek evaluation from an orthopaedic surgeon specialized in hip care. At the Gelb Sports Medicine & Orthopaedic Center, our medical staff is trained in the latest procedures used to procure optimal outcomes for patients. Request an appointment online or contact us at 561-558-8898.